Eight-year-old Colton Bradley, of Bidwell, sinks his teeth into a juicy watermelon Friday during the watermelon-eating contest at the 50th annual River Recreation Festival. The competition was part of the festival’s Kid’s Day activities that began at about 3 p.m. — right about the same time several storm cells dumped heavy rain on the festival at Gallipolis City Park. During Friday’s downpour at the River Recreation Festival, a couple of festival-goers equipped with umbrellas didn’t allow the rain to stop them from grabbing a funnel cake at one of the several vendors lined along First Avenue. Caleb Greenlee, of Gallipolis, tries his hand at the Bass Busters casting tournament Friday afternoon in Gallipolis City Park. Grace Polsley, 6, of Gallipolis, curiously looks over her box turtle moments before the start of the terrapin races Friday afternoon. Several competitors race to the finish line during the sack races Friday afternoon. John Wolfe, 17, of Vinton, has one minute to stack six penne pasta pieces using nothing more than a raw spaghetti noodle. He was competing in one of several “Minute to Win It” events Friday at the River Recreation Festival. Nacoma Smith, 15, of Gallipolis, tries to maneuver a cookie from her forehead to her mouth using only her facial muscles during a “Minute to Win It” competition. Gallia County veterans lead off the annual Fourth of July parade Saturday evening through downtown Gallipolis. MaKayla Price, the 2015 River Recreation Festival queen chosen last Thursday night, rides through downtown Gallipolis during the annual Fourth of July parade. Bobbi Holzer talks to people in the crowd from her golf cart during the July 4 parade Saturday night. Ohio state Rep. Ryan Smith, R-Bidwell, and daughter Camryn toss candy to children lining the sidewalk along Second Avenue during Saturday evening’s July 4 parade through downtown Gallipolis. 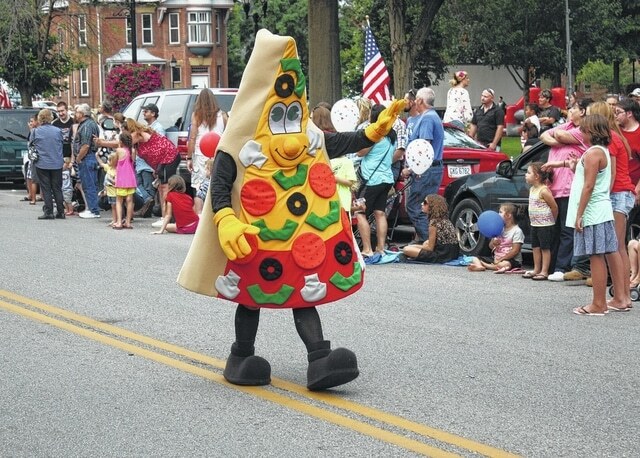 A pizza mascot waves to children during Saturday’s July 4 parade.